Hamza 's claims over his accident are under scrutiny But a legal contact told me that an infamous jihadi explosives manual said something rather different. It is a document that has already been used in evidence in several terrorism court cases. So the search began for a copy of the manual, which I am not naming because it can be easy to find on the internet. It appears for a while before the authorities remove it. It then appears on a new site a few days later. After two weeks of scouring the web, I tracked it down. It has a comic appearance. There is a cartoon bomb on the first page, but the contents are much less amusing. If you have got the desire to do some carnage, some killings, the book is very, very useful for you. Professionally produced and written in English, it is based on a course that used to be led in Afghanistan in the 1990s by Abu Khabaab, an al-Qaeda explosives trainer. If it had been in your hands, your hands would disappear and probably shatter the tissue in your forearms Sidney AlfordExplosives expert In the manual's introduction the author says: "You can be confident that all the explosive mixtures have been tested and do actually work very adequately. After finishing the course, I moved onto another unit for different training, where I met the original developer of this course. "He informed me that it was several years old, completely out of date and I needed to be updated, which I have been in the process of ever since." On page 58, I found the answer to the Abu Hamza question. In a section called "Special mixtures" there are instructions on how to make an acid-based explosive, which again I will not name. At the end of the recipe the author writes: "This liquid is very dangerous. It will explode with a detonator. 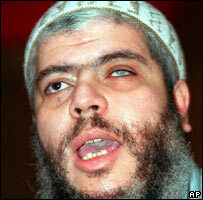 It exploded in the hands of Abu Hamza causing him to lose both of his hands. Nobody tries this one anymore as it is too powerful and dangerous." Explosive test We asked Sidney Alford to make a version of this explosive under safe conditions. An internationally-renowned expert, he was impressed by how powerful the explosive was. It blew a large hole in a steel plate.